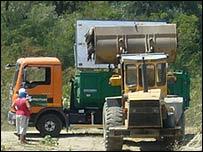 A Romanian company is accused of dumping 47 tonnes of animal carcasses on the outskirts of Bucharest. The firm, Protan, could be fined up to £10,000 ($20,000) and those found responsible could face jail terms. Protan denies the charges but has been summoned by the authorities to help dispose of the rotting meat at Comana. 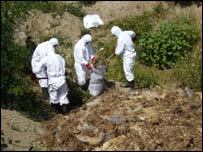 Tackling illegal rubbish-dumping has been one of Romania's biggest tasks since joining the European Union on 1 January 2007. The carcasses are rotting amid heat of 38C, just metres from a main road. Piles of black plastic bags are stacked around the dump, with bits of chicken and even horse carcasses poking through. A strong wind is blowing the stench in all directions, but more worrying is the danger to human health. "This is not our rubbish. We don't use plastic bags, we use rubble for disposal," a Protan employee told the BBC. 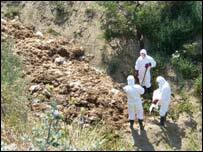 When asked who was responsible for dumping the carcasses he blamed abattoirs or large animal farms. Nearby the head of the Environmental Protection Agency for Giurgiu County, Clara Adam, was supervising the clean-up. "We have asked Protan to clear all the carcasses and representatives from the Veterinary Agency will disinfect the area," she said. Ms Adam says groundwater has been contaminated but water is still drinkable. Only a few hundred metres away, in the village of Gradistea, people show little awareness of the hazard and anyway, they say, there is not much they can do. The carcass-dumping at Comana, 40km (25 miles) from the centre of Bucharest, is not an isolated case. Recently, the Romanian Prime Minister, Calin Popescu Tariceanu, said Glina, another town on the edge of Bucharest, "looks like a rubbish dump". The perpetrators of illegal dumping there have never been caught. More worrying still, a large amount of dangerous medical waste was discovered a few months ago in Chiajna, another link in Bucharest's rubbish-dump belt. A recent report by the health ministry showed that each year Romania was producing 40,000 tonnes of dangerous waste. Regulations say that waste must be destroyed in incinerators, but the disposal costs are around one euro (£0.67) per kilogram, whereas dumping costs are eight euros per tonne, making it tempting to dodge the law. Improving waste management is one of Romania's hardest tasks as a new EU member. Romanian authorities have asked for longer transition periods to apply strict EU norms, sometimes even 15 years. Many millions of euros are needed to bring the country up to standard. Meanwhile ordinary Romanians are still at risk of rogue waste disposal practices.